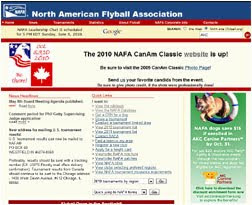 Flyball Prop-a-Ganda flyball blog: NAFA and the AKC? So I went to NAFA's web site yesterday and right there on the home page is a big advertisement for the AKC Canine Partners program (that's the AKC's new mixed-breed registry). Last I heard, the AKC wasn't sanctioning flyball events. Is that about to change? Does anybody have any insight as to why NAFA would put an AKC ad up on the website? Maybe it was just a good deal for NAFA and good publicity all around. If the AKC decided to start offering flyball the way they do Rally, Obedience, and Agility (which they are poised to do, now that mixed-breeds can compete with the purebred dogs), it could mean explosive growth for our sport. This is what happened with Agility back in the mid-1990s when the AKC started sanctioning it. I wonder if it is related to future sponsorships at CanAm? ...the Board, it works in mysterious ways. They are working on promising leads, they are just not at liberty to discuss, for fear....et, al. Wonder how the mystery workers will effect AKC sanctioning? Can they do this without a vote from its members? Gawd I hope not. That would drive me away from NAFA for good. Eli, you mean all NAFA members should vote on sponsoring AKC? no, I mean, how can the AKC sanction NAFA flyball at an AKC event? Wouldn't the AKC intend to bring NAFA within it's "umbrella"? Has NAFA already indicated that it could "swing" this to the AKC? NAFA is a non-profit association. I am wondering, would rules and bylaws and administration changes be at the sole discretion of the BoD? A BoD that is elected by its members; all legal flyball participants at NAFA-sanctioned events are members of NAFA. referring of course, to the ballots that are currently consolidated and sent to the clubs. hmmm...says that NAFA folks get a discount for signing up for the new mixed-breed program. Could be AKC finding a new market for both more money and increased rally/agility/ob entries? I'm struggling to imagine NAFA handing over the keys to the flyball "kingdom" to AKC and letting them run the show but you never know. Maybe AKC is working towards opening a 3rd flyball sanctioning body? I have no clue what's going on. Maybe the AKC offered NAFA a percentage or referral fee to publicize the Canine Partners program on NAFA's site. Easy money for NAFA. Dunno if it has anything to do with CanAm or sponsorships or sanctioning or anything like that. I do know that NAFA generally does not put up ads on their website. Staying ad-free was a big deal when I was on the BoD a few years ago. The only ad I can ever remember appearing on the site was for DogSport magazine (and that was on the Flyball Locator pages, not the home page) because NAFA had an exclusive one-year partnership agreement with them at the time and the ad was part of the deal. So i find the AKC ad to be intriguing, especially since i haven't heard any mention of the AKC before the ad showed up (unless i missed it in the NAFA board meeting minutes or one of the Yahoo Group announcements). Any person in good standing with The American Kennel Club may apply for an AKC Canine Partners listing by supplying The American Kennel Club with required information and complying with such conditions as it shall require. No dog may be permitted an AKC Canine Partners listing if not spayed or neutered. If the dog is too young to be spayed/neutered at the time of enrollment into AKC Canine Partners, the owner certifies that the dog will be spayed/neutered at such time as recommended by owner’s veterinarian. No wolf-dog hybrid may be permitted an AKC Canine Partners listing. Owners are required to acknowledge compliance for both provisions on the applicable online or paper AKC Canine Partners listing application. Further, if requested, the owner must submit proof to verify compliance with these requirements. Spay/neuter is a requirement for any dogs enrolled in AKC Canine Partners to enter to compete in AKC Companion Events. When I hovered my cursor over the AKC ad on the NAFA site, the image title pop-up (not sure what else to call it) said "CanAm Classic Sponsor." The webpage dedicated to CanAm does not have a sponsor list link so I couldn't say for sure. Now why didn't I think to hover over it. LOL. Good work! I registered my dog with Nafa during that DogSport promotion and never got my magazine. Hmm. I think it's safe to say that AKC's spay/neuter requirement will prevent the AKC and NAFA from ever really partnering up in any official capacity. I don't see NAFA compromising on that. In digging around yesterday i ran across an article on DogSport magazine's website written by Penny Leigh, who is listed as the program manager of AKC Companion Events (http://www.dogsportmagazine.com/?p=539). Penny happens to be Leerie Jenkins' teammate on Fur Fun. So maybe this is just an example of networking at its best. NAFA needs big CanAm sponsors and the AKC wants more mixed-breeds to register for their program (and NAFA has many mixed breed competitors), so the 2 organizations are a perfect marketing match this year. Back in the beginning of NAFA when they developed the earning points for titles many of us were dissappointed in the fact that AKC would not recognize our titles earned because NAFA accepted "mix breeds". Having a AKC Champion and obediance titled dog I always yearned to say that Kirby was a dual Champion. Now, maybe AKC will allow those who compete in obediance to add our NAFA titles on our dogs name. It would be a dream come true for some folks. ....and I don't see NAFA handing off our santioning to AKC either. I think it's a partnership for positive, responcible dog ownership promoting training and having fun with our canine companions. As Martha would say "It's a Good Thing"
Will AKC allow people to list their NAFA titles behind their dog's name? The issue is a legitimate question because the AKC must "recognize" a sanctioning body (be it for a specific breed of dog or an "activity" such as Agility) before it will allow such titles to be listed behind a dog's name in the AKC Registry. Of course, people often list these titles anyway but, they can't in the AKC registry. I could see a lot of NAFA players benefiting from a closer relationship between NAFA and the AKC because they do AKC Conformation showing or participate in various AKC Obedience venues. (Tracking, Obedience). They could list their show "Champion" as a dual champion both in AKC and NAFA. AND, NAFA could leverage their influence to keep flyball strictly a NAFA activity and negotiate an agreement with the AKC to NOT compete with NAFA for flyball. That would be interesting, wouldn't it? We have a member who benefits from her dogs' first several NAFA titles (don't know what the max points recognized by AKC are) toward Utility titles in AKC. Are Utility titles restricted to specific breeds? The concerns that I've heard expressed from some people in the "dog world" about the AKC mixed-breed program is that if your dog is not an AKC breed (or in the Foundation stock servce) or a mix - then they must be spayed/neutered in order to get listed. I know there were were a handfull of serious pit bull people that did not want a dog registered as an American Staffordshire Terrier and yet, they were showing in either UKC or ADBA and needed the dog to remain intact. Could this be a similar issue for JRT or BC people? Chris, can you clarify what you mean here? "AND, NAFA could leverage their influence to keep flyball strictly a NAFA activity and negotiate an agreement with the AKC to NOT compete with NAFA for flyball." 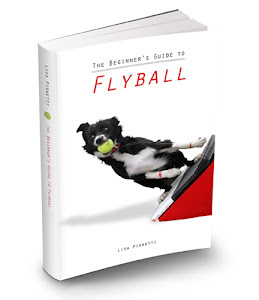 Will you ever see flyball at an AKC event in the near future? Most likely not. I remember going to Novi over the years and the AKC Event people thought that flyball people were just trailer trash, but we are the ones that pick up after our dogs. At the IKC in Chicago, flyball was the biggest draw and took all the media away from the conformation ring. So flyball was not invited back as each year flyball was getting more and more of the media and people's attention. NAFA tried to join forces with USDAA with Cyno over the past few years....but nothing happened to help grow flyball with that joint venture as USDAA controlled the whole process. I think that CanAm will grow over the years as NAFA can control the whole event. It's up to the BoD to put a plan in place and execute it. What I mean is that the AKC would agree to NOT sanction "Flyball" as an AKC event. That the AKC would recognize NAFA's jurisdiction over flyball events and would agree to "not compete" directly with NAFA by sanctioning "AKC Flyball". Think about it. AKC is a "competing dog agility organization" against NADAC and USDAA dog agility by sanctioning its own "style" of Dog Agility. For some Agility folks, it just means MORE agility for them to compete in. They want to have as many titles as possible so they compete in ALL of the Agility venues. ...but, there are some folks who "prefer" NADAC over USDAA or USDAA over NADAC and I haven't a clue how AKC Agility fits into the big "Dog Agility" picture. I do imagine that NAFA is probably requesting that AKC refrain from thinking about sanctioning "AKC Flyball". Its in the "best interest of NAFA". Chris, AKC is a major player in dog agility. Among other things, the dogs sent to the FCI Worlds are all all picked by the AKC, which means, historically, they are all purebreds. I don't know if the new rule has any prohibitions about special honors like being picked for the World Team. Certainly, I would not want purebred advocates in charge of anything, whatsoever, for flyball. This is most likely why? The trend of AKC is down since 1992 and droping fast. "The American Kennel Club (AKC) organized a new AKC Canine Health and Welfare Advisory Panel. The panel's goal will be "to provide factual and impartial information by creating a forum for proactive discourse based on scientific and ethical concerns," according to a media release. "The AKC hopes to strengthen opportunities for the public to admire, love and own purebred dogs and to foster greater public education about health concerns relevant to all dogs." The announcement follows the American Veterinary Medical Association (AVMA) meeting this month, where ear cropping and tail docking were the topics of much conversation. In November 2008, the AVMA Executive Board amended the association's policy on the procedures, strengthening its stance against them and angering the AKC." I don't understand this -- *Utility* is an obedience level/title of competition. In AKC, having NAFA *titles* in NO way aids in getting a Utility (UD) title -- if it did, my ONYX should have his OTCH by now . AKC's spay/neuter requirement would keep a lot of flyball dogs out of an AKC flyball program although just having another title venue would draw a crowd from the *masses* with eligible dogs. I can't see *AKC flyball* being like we know it. For one thing, EJS are so expensive even the BIG AKC clubs would hesitate to invest in them and I don't see the AKC spending enough money on them to be able to sustain the number of tourneys that would be running any given weekend. Second, how many of our regions can support that number of flyball tournaments -- agility or obedience can happen every weekend and we could all take our dogs and trial every weekend... can we race flyball every weekend ?? So how can there be a large enough number of adequately attended tournaments to support a flyball program for AKC ?? Not to mention what it *could* do to wipe out the NAFA program if it WERE well attended. The only decent solution is some kind of co-op and as stated, there are some roadblocks in the way of that, as of now. Flyball is such a different *breed* of dog sport, I'm not sure it would be a feasible program for AKC. Also, in my experience, almost ALL AKC obedience exhibitors, agility exhibitors or conformation enthusiasts want NOTHING to do with the *trailer trash* that plays flyball or breeds mixes especially for the game. Few flyball clubs have co-existed with AKC agility or obedience clubs for any length of time -- most collapse or split off. plus the above received anywhere from 23,000 to 108,000 in additional compensation.